Julio Cesar Chavez Jr fights Marco Antonio Rubio, hopes to take some padding out of his record. Julio Cesar Chavez Jr is more carefully handled than the Mona Lisa, but not even his promoters or management have full control over his career; it belongs to the fans, or at least that is what they think. The son of the ring legend has never had that quiet period where a fighter builds up his skillset in obscurity - instead he has spent his entire career under the eyes of the boxing world. Thank god for Canelo Alvarez. If it weren’t for him, Chavez Jr would be under twice the amount of pressure. Both he and Canelo don’t fight for themselves, they fight for Mexico and they belong to their Mexican boxing fans. Some of these fans wonder why Chavez Jr spent so long padding up a record to the point where he has forty-four wins at just twenty-five years old, and I say there are a couple of reasons. Building up his chops is one; you fight guys who can test you in the ring, get you used to different situations but don’t pose too much of a risk. That’s not the main reason, but you can probably guess what it is. I'll give you a clue - Bob Arum has lots of it, and most of us don't earn enough of it. Somewhere into Chavez Jr’s twentieth fight Bob Arum had him headline a fight card that he sold on PPV. It wasn’t a big deal and wasn’t expected to sell much, but thousands of people bought into the fight and made it an unexpected success. Dollar signs flashed in Arum’s eyes and Chavez Jr spent the next dozen fights headlining minor cards that lacked star names but gave Top Rank a steady flow of cash. 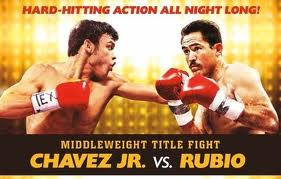 You might moan about Chavez Jr's padded record, but tonight he faces a quality opponent in Marco Antonio Rubio. It's a good fight. Some people see Chavez Jr’s career path as a straight line pointing toward ring glory, but don’t go thinking Rubio is just a waypoint. The thirty-one year old had a great 2011 going 4-0 with four knockouts, all against decent opposition. He started with a seventh round TKO of undefeated David Lemieux and then walked through Ricardo Ramallo and Mohammed Akrong, ending the year with a fifth round win over Matt Vanda. Rubio has a few scratches on his record, notably a 2009 title fight loss to Kelly Pavlik, and he’s lost another four besides that. He's not a perfect fighter and he’s never going to have the technical genius of Floyd Mayweather, but he is tough, has lots of experience and he’s riding on a high. If Chavez Jr beats Marco Antonio Rubio, it is a great name to add to his CV. Chavez won’t want to look too far ahead of Rubio but that doesn’t stop the rest of us speculating. Two guys have already been talked about as opponents for the Mexican in 2012, Antonio Margarito and Anthony Mundine. Margarito lost out in one of the biggest fights of 2012, his rematch with Cotto, and Mundine is a retirement time-bomb thanks to problems with his left eye. Neither are the fighters they used to be, but both would look decent on Chavez’s record. Let’s see how he handles Rubio first. Punchbag Blog's pick is a tough-won Chavez Jr points victory.